Cats know that cracks and crevices are where all the fun critters to play with hide! 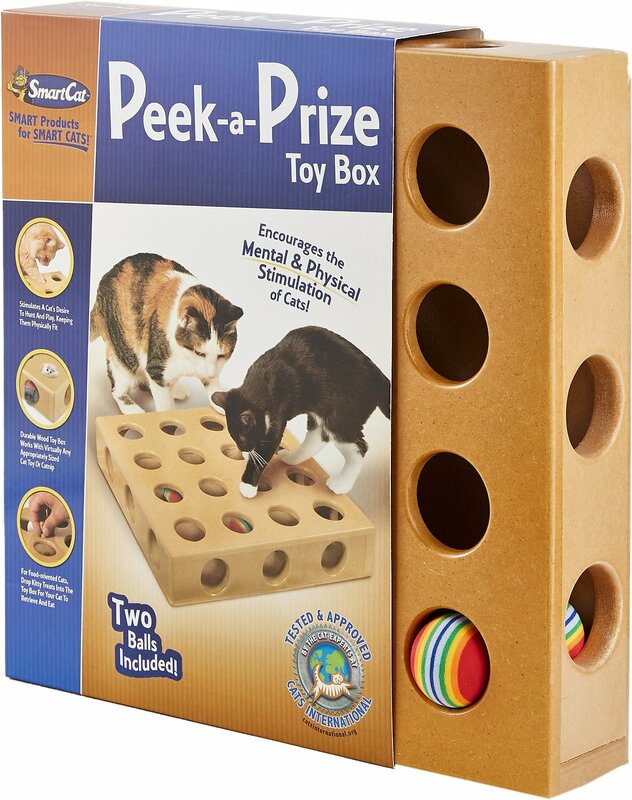 Keep your fur baby entertained when you're not at home with the SmartCat Peek a Prize Toy Box. 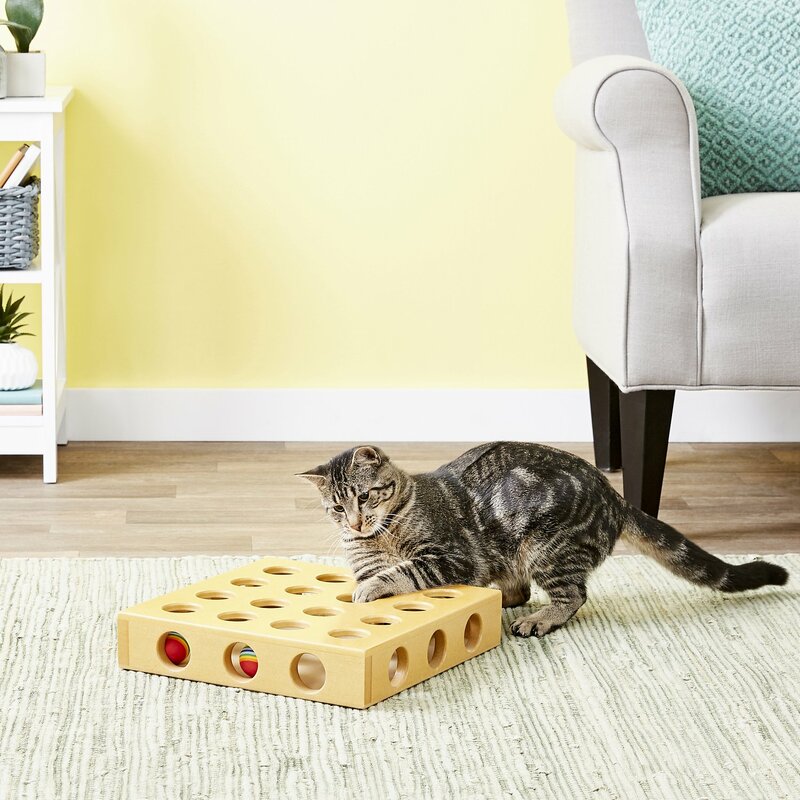 It's designed to partially conceal toys, piquing your cat's interest and making her paw each toy to get it out. The Peek a Prize Toy Box comes with two toys but can be used with any appropriately-sized toy or tasty treat! Not intended for children and only for supervised use with kittens. Keep safety in mind. If a toy or accessory is one that you would not give to a child that is 3 years old or younger, please do not give it to your cat. Click here for replacement balls. Ingenious idea but needs work. I too almost fell over at the smell (off-gassing?) when I opened the package. I took it outside, hosed it off and left it outdoors to dry in the sun for 48 hours, periodically giving it the sniff test. Once the odor was gone, I brought it inside and my cats loved it -- I tossed in a few treats along with their toys in addition to the two balls included. All 4 of my cats love digging out the toys and treats. I suspect that those whose cats weren't interested were reacting to the odor. My 5-month old kittens enjoy knocking the toys out of this toy box. They especially like the balls that came with the toy. Yes, the balls easily fly out the sides, but I think this makes it easier for them to be less discouraged when trying to get their prize. I put the Hexbug toy in it and they really liked that too. I am happy with it. It certainly looks better on the floor than the cardboard box with holes in it that I had created for them before. The only reason for -1 star is that I think it's a bit expensive. But it is a good quality construction just the same. 2 days later and they're done! Both cats were interested for the first couple of days. I had lots of other balls, small mice that I put in the holes,even put some treats in. Now, they walk by it without looking at it. Think I'll put it away for a while, then take it out again. This cat toy is a nice idea and my cat played with it as soon as I set it down. But it is way too easy. It comes with two same-sized balls. 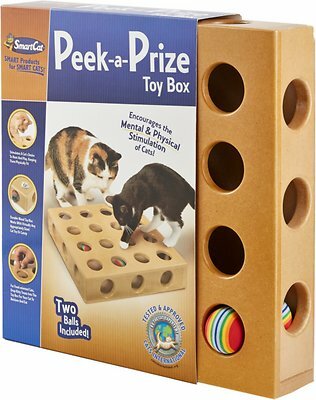 The box has 16 holes on the top for the cat to poke her paws in and move the balls around. 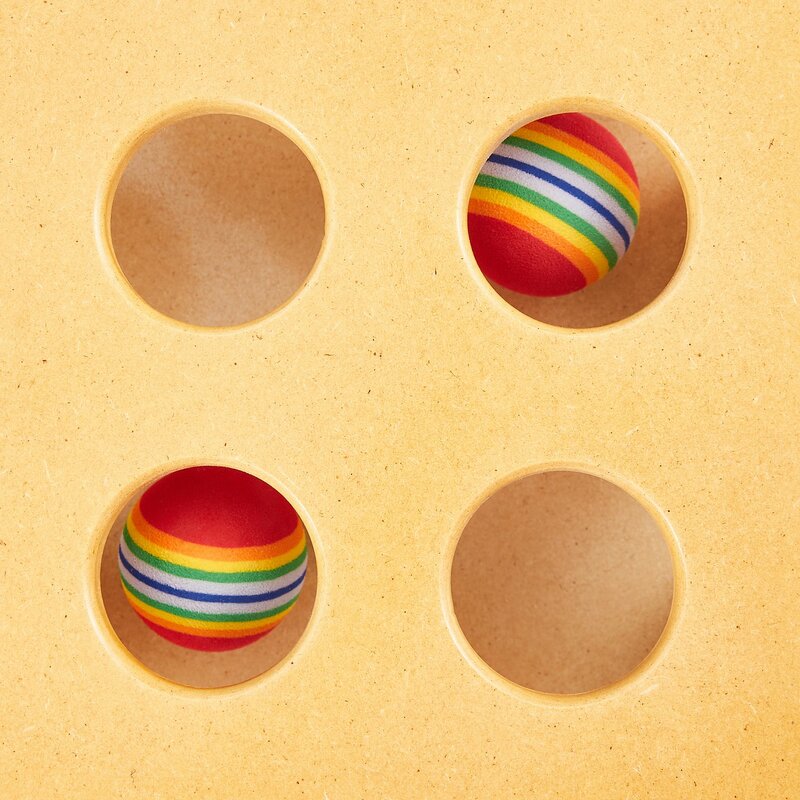 There are three holes on each side of the box, all the same size, and all of which the balls can fit through. My cat had both balls out of the box within seconds. Once out they ended up under all kinds of furniture and may never be seen again. The toy is then useless. Not much fun for the money I paid. My cat loves this toy, for as long as the ball is in it... which is about 2.3 seconds. He mastered it within 5 minutes of me putting it down. The balls should be larger so they aren't as easy to get out. They are awfully small. So now we have a holey box in the middle of the floor serving zero purposes. I even tried to put another toy in there and he won't have anything to do with it. I don't feel like this was worth the price. I bought this because I have one cat that likes to put his mouse toy under my husband's weights and fish them out. He likes this toy, but it really depends on what's in it. The balls it comes with are okay. I bought a hexbug to put in it, and he finds that more entertaining. He does get bored with it though, so I have to put it away for play at another time. It’s a great thought but the balls come out the sides so yo are always looking for them if you don’t get them right away! The holes on the outside of the box need to be a little smaller than the balls!! I purchased this for one of my cats who particularly hates being inside, and gets bored very quickly. She's completely obsessed with this. We can go for hours of me putting the toys in, and her working them out over a few minutes, to repeat the cycle. I took a tip from another reviewer, who suggested getting larger treats to put in too. I also use the freeze-dried minnows, and my cat enjoys getting those out too, although that takes longer and requires a different technique. DEFINITELY recommend if you're trying to keep a cat happy and entertained. It doesnt take up much floor space, is very cost effective, and a big hit with bored kittens. Best toy we’ve ever had! Our two cats absolutely love this toy! They are pretty playful to begin with, but I think this definitely helps stimulate them a little more than normal. I agree with others about wishing the toys stayed in the box, but then again, you can always choose other larger toys to go inside and keep them occupied a little longer.